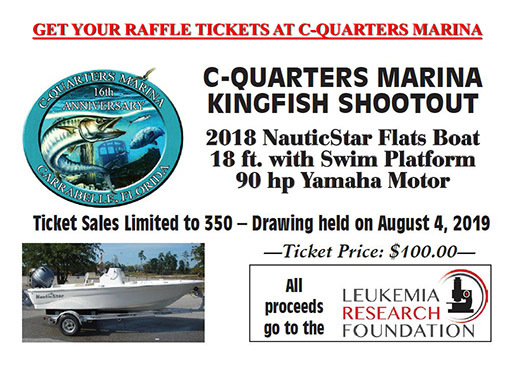 C-Quarters Marina is located in Carrabelle, Florida. This full service marina features 67 boat slips with slips located in the front for transit boats. We can accomodate boats up to 53' in length and with a 20' beam. Dockage rates vary. Both diesel and non-ethanol fuel are available. Free WiFi and free pumpout with slip. Laundry mat and clean showers on site. A public boat ramp is just east of the marina with plenty of trailer parking. Charter boats are also available at the marina. See the Charters section of this website for more information. C-Quarters Marina offers a discount to Boat U.S. members and America's Great Loop Cruisers' Association members. The marina has a complete ship store that includes fuel, fresh and saltwater bait, tackle, ice, ammo and cammo. Open seven (7) days a week from dawn to dusk. C-Quarters Marina is located in the middle of town within easy walking distance for shopping, groceries, library, etc. Visit and relax on our well-known front porch.